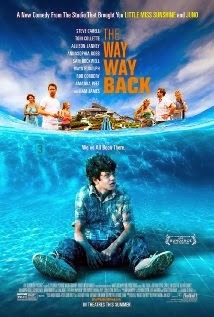 The Way Way Back (2013), PG-13, 103 minutes - I saw the trailer for this film earlier this year but missed it once it was released. I was able to catch it on the plane on the flight back from our honeymoon and it made two hours of the nine hour flight quite entertaining. The Way Way Back is a 'coming of age' story, but it manages to do so without seeming run of the mill. It uses the same formula that made Little Miss Sunshine the darling of a film that it was: a great cast, funny dialogue (despite some very serious moments), and a strange family dynamic. Bear in mind, these components make it difficult to mix correctly, but The Way Way Back gets it right. Duncan (Liam James) is on a summer 'family' trip with his mother Pam (Toni Collette), her boyfriend Trent (Steve Carrell) and his daughter Steph (Zoe Levin). He's a shy kid and is completely out of place. He doesn't trust or like Trent and feels increasingly outcast in this home away from home. The girl next door, Susanna (AnnaSophia Robb), is about the only one that will speak to him, but that awkward teenage boy/girl dynamic makes things progress slowly. He escapes from the rest of the house whenever possible and falls into a friendship with local water park owner Owen (Sam Rockwell). Duncan begins working at the water park and quickly finds his place of comfort among his co-workers. This is one of those movies that just has a really great cast across the board. The highlights are definitely Rockwell and James (Duncan and Owen learn and grow from each other), but the rest of the cast feels organic. No one feels out of place. Allison Janney, Maya Rudolph, Rob Corddry, Amanda Peet, and co-writers/directors Nat Faxon and Jim Rash all contribute to this feeling and I would be remiss not to mention them. Quick side note - I had personally never put names to faces previously but Nat Faxon and Jim Rash were the 2012 Oscar winning co-writers for their script for The Descendants. The Way Way Back probably flew under the radar of most folks but is absolutely a film worth giving a look.